This grand, Italian Renaissance style mansion in Manhattan is regal and dignified. Of course, James Burden Mansion is the perfect venue for a lavish event. Being there is like stepping back in time to the Golden Age. The spiral staircase, marble walls, fireplaces, and striking architecture will have your guests talking for years to come! There is so much detail, one hardly knows where to begin looking. This remarkable NYC mansion is undeniably magnificent. 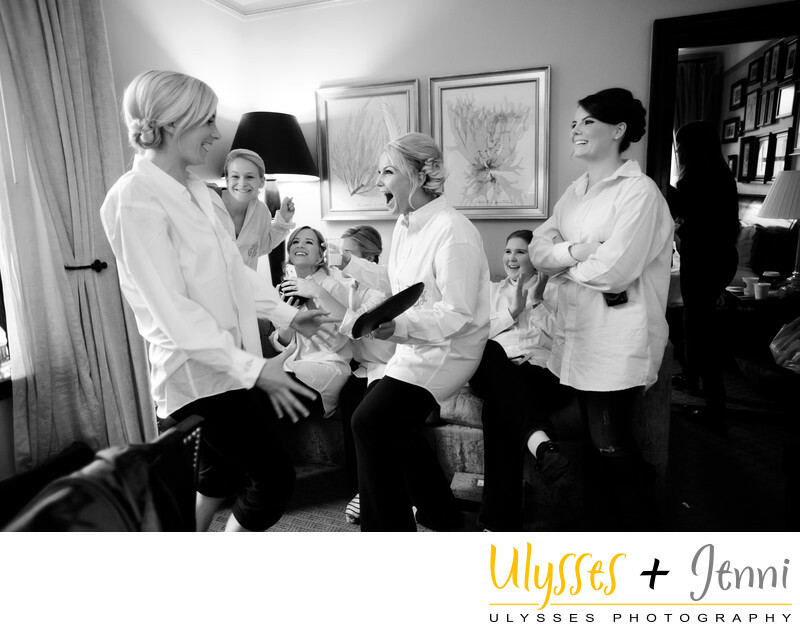 Before making our way to the mansion, this bride got dressed at the Wales Hotel on Madison Avenue. This set the scene for one of my favorite photos, which you can see here in black and white. The pure excitement and joy of the bridesmaids celebrating with this bride is infectious and heartwarming. Stripping away the color and viewing the photo in black and white just adds to the emotive draw of this image. This photo is also special to me because one of these bridesmaids later became a bride herself. She contacted us right away when she got engaged to make sure that we had her date, which happily we did! We got to see some familiar faces at that wedding, making it an even more joyous day. Just steps away from the James Burden Mansion is iconic Central Park, so we walked over with the couple for some quintessential New York photos. We then headed back to the mansion on 5th Avenue. There we made use of the courtyard for family and wedding party formals before the ceremony. The rest of the day moved all too quickly. All who attended were treated to a premium experience in the spectacular spaces of the James Burden Mansion, as well as on the dance floor. We can’t wait to return! Are you getting married at the Otto-Kahn mansions? If so, let us know how we can help make your day even more beautiful! Location: 7 East 91st Street, New York, NY 10128.